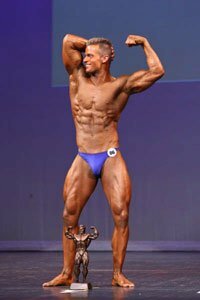 Amateur Bodybuilder Of The Week - Steve Moerman! Steve loves bodybuilding because of the amazing discipline it requires. When he puts his mind to something, he's driven to do his best in it. Bodybuilding challenges him to keep doing this. [ Q ] How Did You Get Started? I grew up a very athletic kid. I was a competitive hockey player, and was involved in all school sports. As I was growing up, my dad always worked out in our basement, which naturally made me want to do the same. I first started lifting weights in Grade 10, off and on. I began training consistently, five times a week, the summer before grade 11. I continued to train throughout high school, slowly making progress. Upon entering my first year of University, I decided I wanted to take my training to the next level, and compete. 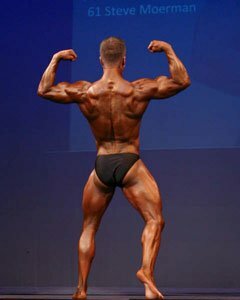 I was hooked after my first competition, and have trained hard all year ever since. [ Q ] What Workout Plan Worked Best For You? For the most part, my contest prep exercise plan stays the same as my offseason one. [ Q ] What Nutrition Plan Has Worked Best For You? My offseason nutrition plan consists of the same foods as my contest prep diet; however my carb intake is considerably higher. I will include more high glycemic carbs after my workout, and include a serving of low glycemic carbs with meals 1-6. [ Q ] What Supplements Have Given You The Greatest Gains? I&apos;m a firm believer in REAL FOOD being the staple of a bodybuilding diet, however some supplements are necessary. I enjoy Dymatize Elite Whey Protein Isolate (Chocolate, or Café Mocha Flavors), and I also use BCAAs and Glutamine. The BCAAs help a lot in preventing catabolism during a cutting phase. [ Q ] Why Do You Love Bodybuilding? I love bodybuilding because of the amazing discipline it requires. When I put my mind to something, I&apos;m driven to do my best in it. Bodybuilding challenges me to keep doing this. It&apos;s amazing to see how much the body can change with proper diet and exercise. I love bodybuilding because it has taught me how to live a healthy lifestyle. Health and wellness is a very important part of my life and bodybuilding challenges me to keep living it! [ Q ] What Motivates You To Follow A Healthy Lifestyle? One of the biggest motivators for me to continue living a healthy lifestyle is my job. I&apos;m a personal trainer and boot camp instructor for Contestprep.ca. I feel that it is very important to lead by example to help motivate my clients to also live healthy lifestyles. I plan to pursue a career in physiotherapy, so exercise and wellness is going to be a huge part of my life for a long time! [ Q ] What Made You Want To Achieve Your Goals? I believe that over the past few years, bodybuilding was something that I was called to. Knowing that this was something God had planned for me, I gave it 100% of my efforts to succeed and achieve my goals. It has provided many opportunities for ministry, I&apos;ve made so many good friends, and I&apos;ve learnt an incredible amount of useful information. [ Q ] What Are Your Future Bodybuilding Plans? I am planning on taking a few years off from competing, to put on some serious size. I no longer qualify for the Junior category, so I feel that I need at least a couple full years of training to be competitive in the open category. I may compete in another Fitness Model competition next year. [ Q ] What One Tip Would You Give Other Bodybuilders? My one tip for other bodybuilders is to try and avoid focusing on placing/winnings. I&apos;m a firm believer in setting goals and working hard for them, however your main goal in bodybuilding should be to come in looking better than your previous show. If you can succeed in this, then you&apos;re already won. This is easier said than done, but you can&apos;t control who else is gonna show up! [ Q ] Who Are Your Favorite Bodybuilders? [ Q ] What Features Do You Use On Bodybuilding.com? I love Bodybuilding.com&apos;s article listings! There are so many helpful articles that are helpful for any level of athlete. It&apos;s especially been helpful for small details, such as what to bring the day of the show, or tanning techniques. 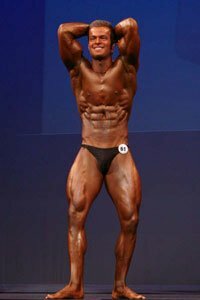 Bodybuilding.com&apos;s store has always been where I purchase my Pro Tan and Dream Tan for show time. They have competitive prices and fast shipping. You Could Be Our Next Amateur Of The Week! No longer content to sit on the sidelines? These guys & gals have gone from wimp to ripped! Age is no excuse for these over 40 men & women who have decided to feel and look young again! You have come to the right place to check out info, pics, and links about our amateur contest winners! New amateurs are added every week!